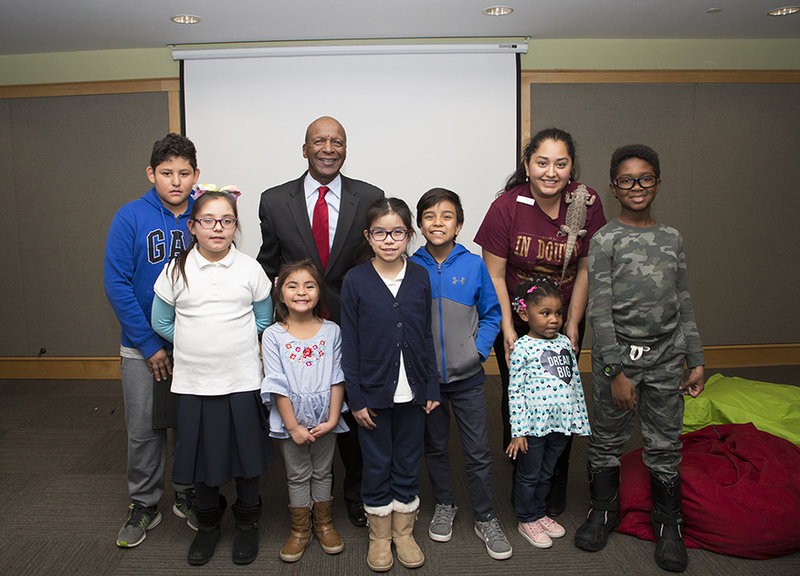 IL Secretary of State Jesse White visits WPL! 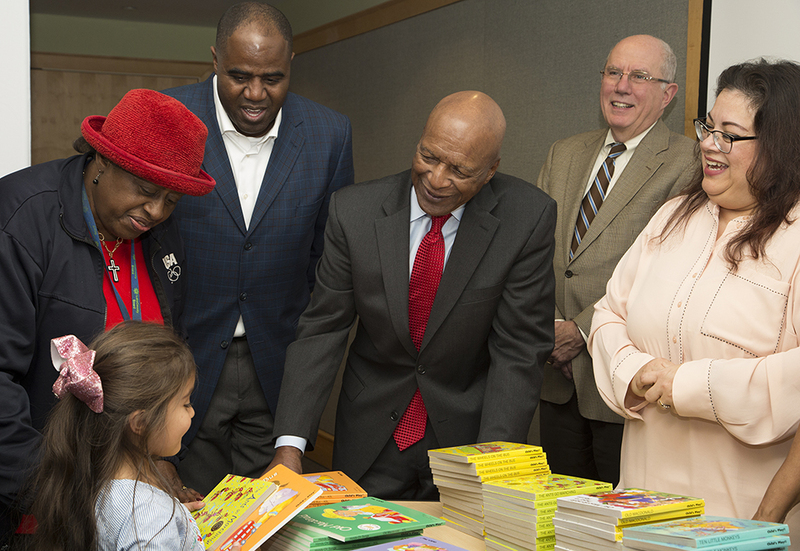 We were so excited to welcome Illinois Secretary of State Jesse White to Waukegan on Thursday, November 15 for a celebration of reading. Kids had the opportunity to meet White and Mayor Cunningham, ask questions, and receive books from the Illinois Literacy Foundation. During the event, families learned about the importance of reading together and their local library. They even had a chance to meet the library’s pet bearded dragon, Lizzy. “Reading prepares you to be a good citizen,” White said. Our children’s reading programs have encouraged children and their parents to use books as a way to expand children’s experiences of the world. In fact, our 2018-2019 children’s winter reading club asks kids to learn about different holidays through reading. Our executive director, Selina Gomez-Beloz, agreed with Secretary White. “We believe that reading is a great way to understand and celebrate the diversity of our community,” she said. “We were honored to host Secretary White and appreciate his commitment to our services for children and especially for adults.” The library’s Adult Literacy Tutoring program, which is the only library-based program in Lake County to be funded through an Illinois Secretary of State grant, uses one-to-one and small group formats to help adults testing below the 9th grade level to make measurable gains in their reading, writing and/or math skills. In turn, this leads to improved economic, professional and personal outcomes. Secretary White also talked about reaching goals, telling the children how important it is to persevere through challenges. “If someone tells you that you can’t achieve something, you say – ‘just watch me! '” White said, earning applause from the little ones in the front row. He noted that it’s the role of parents and community members to work together to help kids reach their dreams, and that family activities, like reading, can be part of that work. White was introduced by Mayor Sam Cunningham, who explained White’s responsibilities as secretary of state to the children, and spoke briefly about the purpose of the visit. An elected official making time to visit the library showed how important it is to make the most of the library’s programs and services, he said. Mayor Cunningham also spoke to the children about how being a good citizen of Waukegan isn’t just the responsibility of the aldermen and city officials present, but everyone, including Waukegan’s youngest residents. He encouraged the children to be good friends and neighbors to their classmates at school. The children responded by inviting him to visit each of their schools! Waukegan’s elected officials were well represented, with the group including Aldermen Edith Newsome, Patrick Seger, and David Villalobos, city officials Janet Kilkelly and David Patterson, Lake County Commissioners Mary Ross Cunningham and Angelo Kyle and Lake County Judges Luis Berrones and Charles W. Smith. Library Trustees Mary Stickels, board president, and Chetara Jenkins, as well as Waukegan Public Library Foundation board member Anton Mathews were also on hand to welcome White to Waukegan. We appreciate everyone making time to join us for this special event! This was the second Family Reading Night to have a focus on space this year, as the library hosts Explore Space!, an interactive exhibit presented in partnership with the American Library Association. Programming for all ages around the Explore Space! exhibit continues through mid-December, with an upcoming trivia program on December 1 as the next opportunity for families to travel together beyond our solar system. 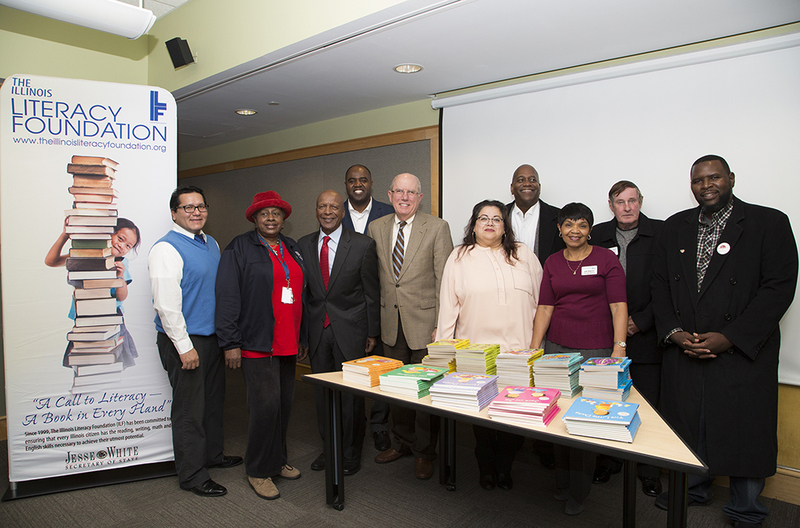 From left: Alderman David Villalobos; Lake County Commissioner Mary Ross Cunningham; Illinois Secretary of State Jesse White; Mayor Sam Cunningham; Judge Charles W. Smith; Waukegan Public Library Executive Director Selina Gomez-Beloz, Lake County Commissioner Angelo Kyle, Alderman Edith Newsome, Alderman Patrick Seger, Waukegan Public Library Foundation board member Anton Mathews. From left: Isabella (age 4); Lake County Commissioner Mary Ross Cunningham; Mayor Sam Cunningham, Secretary White, Judge Charles W. Smith, Executive Director Selina Gomez-Beloz. Secretary White and Waukegan Public Library reference assistant Diana Wence (with Lizzy the bearded dragon in tow) with some of the children who participated in the event.